Both Indian and Chinese cultures have been using acupressure in some form for over 5,000 years. It is still widely practiced in China today. In India, yogis used (and still use) a bed of nails to help them improve meditation and promote healing. In Western civilizations these practices are quickly gaining recognition as a form of alternative health care that is very effective for multiple ailments. In the 1970`s a man named Ivan Kuznetsov developed the first modern acupressure mat in the former USSR, and called it the Kuznetsov Ipplicator (or Applicator). The mat went on to sell over 70 million units in Russia alone. In 2008 the acupressure mat was introduced in Sweden and over one million were sold in the first year and a half alone. Now acupressure mats are available in North America, and are expected to become a “must have” item for people looking for natural pain & stress relief, better sleep, and increased well-being. Ivan Kuznetsov was a kindergarten music teacher int he 1970’s in Russia, and as he was the only male teacher at the kindergarten, he was one day asked to treat the buildings with insecticides. He was given a gas mask and overalls, but no gloves. Unaware of the potential dangers he was exposing himself to by not wearing gloves, Ivan Kuznetsov performed the entire task and handled the highly toxic chemicals with his bare hands and became severely poisoned because if this. The result of he toxic expose was very severe and resulted in chronic pain, unpaired peripheral circulation which caused muscle spasms so severe that Kuznetsov could not more his limbs for weeks at a time, and his kidneys had practically failed as well. Kuznetov found that acupuncture treatments were the only thing that worked to relive his ailments, but because acupuncture treatments were expensive, he could not afford to go as frequently as needed. He tried to perform acupuncture on himself but failed because so many acupuncture points were on his back and unreachable. In his desperation he invented his Applicator by inserting thousands of office pins into a sheet of tire rubber which he proceeded to lie down on. With his body weight evenly distributed on the entire sheet, none of the needles penetrated his skin,and as crazy as his idea seemed, IT WORKED! Ivan Kuznetsov patented his invention in 1979 calling his newly invented acupressure mat the Kuznetsov Ipplicator. In 1980, a major newspaper wrote an article about his invention followed by an article in a popular science magazine in 1981. Clinical trials on the effectiveness of Kuznetsov Ipplicator (Acupressure Mat) were then conducted by numerous institutes, and in 1987, the main “Medical Newspaper” published an article about a lady who had suffered from insomnia for years was able to fall asleep after only 15 minutes on acupressure mat. Several medical doctors had been interviewed about how the acupressure mat worked. After that, lots of reports kept coming in about how the acupressure mat was effective for many other ailments including asthma, colds and flu, insomnia, panic attacks, stress, arthritis, high blood pressure, and even increased libido in men and women. The Kuznetsov Ipplicator became very popular and over 70 million units were sold in Russia in the 1980’s. Ivan Kuznetov regained his health and lived well into his 80’s. The Kuznetsov Ipplicator is also called the Kuznetsov Applicator was the first acupressure mat which is now sold under many brand names including the Heavenly Acupressure Mat, shakti mat, spoonk mat, halsa mat, yantra mat, himalaya mat, pranamat eco, and Heavenly mat. 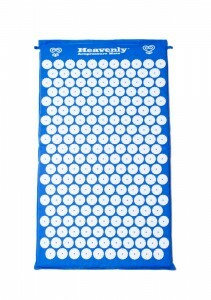 Buy your Heavenly Acupressure Mat here!